For those of you heading to potluck style gatherings this weekend, we have one more recipe to share: Roasted Root Vegetables. While we all love indulging in the creamy dips and heavy casseroles, it’s nice to break things up with something lighter. Root vegetables are in season almost year-round but especially in the fall and winter. From a variety of potatoes to a rainbow of carrots and beets, they make a colorful and flavor-filled side dish. This recipe is super simple. All it takes besides the root veggies is a little olive oil, some salt and pepper and a few rosemary sprigs to give it a nice festive flavor. 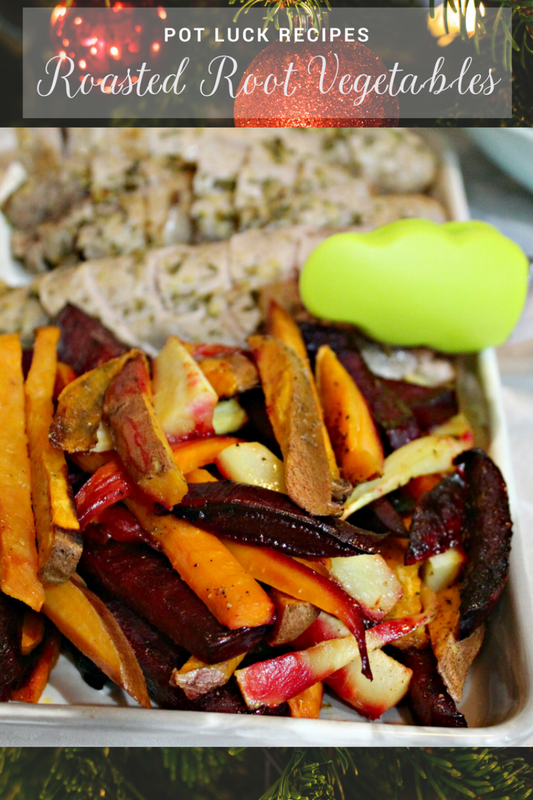 The work is in the prep time, afterwards place the veggies on a serving platter and you’re good to go! We’re using sweet potatoes, carrots, parsnips and beets but any kind of fall or winter squash like butternut or acorn would work well. You could also include a variety of potatoes like red skin or purple. Add Brussels Sprouts halfway through the cooking time to add a leafy touch to the mix. Whatever you see available at your grocery store or whatever speaks to you when you’re shopping will work fine. The reason why this is root veggie focused is because they all cook at about the same time. This is the most important thing to consider while whipping up this dish. Make sure all the veggies are about the same size and consistency so they cook even. You don’t want some of the vegetables to be mushy and others to be raw. If you want to add in other non-root veggies like Brussels Sprouts, Google their roasting time for 425 degrees and pop them in when there is that many minutes remaining. Be sure to mix everything together when you add more vegetables so they get a nice coating of oil and seasoning. So while everyone else is bringing creamy dips and heavy casseroles, you’ll bring a nice change to the table with beautifully roasted veggies. The colors scream winter, especially the deep purple in the beets. If you want to add even more color, add in some golden beets or get rainbow carrots. To add a little spice, sprinkle crushed red pepper when you season the vegetables or use a teaspoon of cayenne pepper. If you’d like a hint of freshness, squeeze a bit of fresh lemon over the vegetables before popping in the oven and leave the squeezed wedges around the pan. 1 - Preheat the oven to 425 degrees. Prep a baking sheet with tin foil. 2 - Cut each of the vegetables into spears or sticks as best as you can. Try and keep them all around the same size so that they cook evenly. 3-4 inches long and approximately 1-inch thick is a good size. 3 - Place the vegetables evenly on the baking sheet. Drizzle with the olive oil and season with salt and pepper. Toss gently. 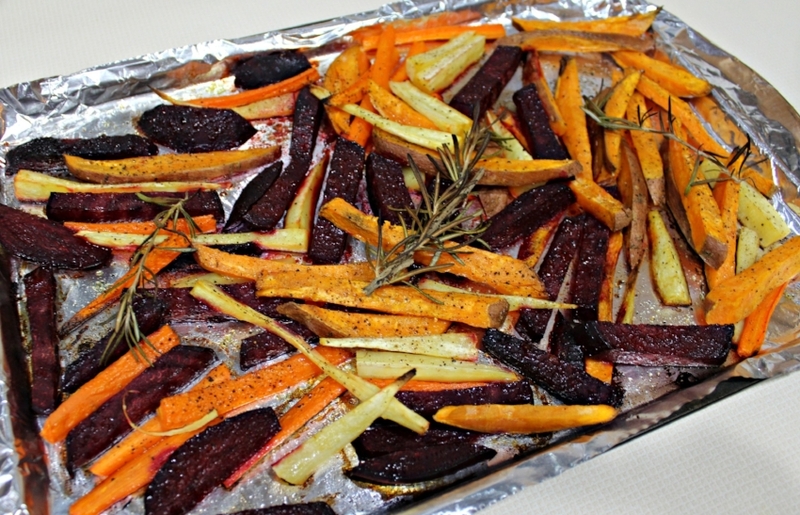 Lay the rosemary sprigs across the top of the vegetables, place in the oven and bake 30-40 minutes until fork tender. Serve.